Where are the Miami Dolphins right now? That is the question I want each of you to ask yourselves. BUT, before you ask yourself I want you to remove emotion from your analysis. I want you to look objectively at this team. I don’t care how big of a fan you are. I don’t care how much passion and money you’ve invested in the team. I don’t care how long you’ve been a fan. Look at what we have with no bias, prejudice, or emotion. Look at our players. Look at our coaching staff. Look at our front office. What do you see? Remember, be objective. Remove emotion. Emotion can be incredibly blinding. It can cloud your every thought and cause you to make exaggerated, extreme statements you wouldn’t normally say if you were in your right mind. I see a team with a lot of promise. I see a team not far away who also has the ammunition to get them where they want to be. Am I wrong? We have a very talented core of guys, and we are only going to get better this offseason. The Dolphins have five draft picks in the first three rounds. That means, barring trades, Miami will have drafted five prospects by the 82nd overall pick in this year’s draft. That is a ton of firepower for a team that's already showing signs of looking a lot better. Thanks to moves by our front office, we have a lot of talent and a lot of options to build on that talent this offseason. That man is Jeff Ireland. Why is Ireland so disliked? There are a few reasons that, when combined, really rub fans the wrong way. His interview with Dez Bryant that got way more media coverage than it should have is what really started it all. The sports media found a story they knew would draw a lot of attention so they focused on it. They didn’t care about the context. Ireland asked Bryant if his mom was a prostitute. That’s all they saw, so they ran with it. In the Dez Bryant “scandal” there wasn’t any need to dig deeper like a true journalist. Just say Ireland asked Bryant if his mom was a prostitute and you’ll get just as many (if not more) clicks as you would if you found out the context of the actual discussion that went on. That’s all people care about anyway. They don’t want to know the context and how exactly the conversation went. They want to see someone mess up and look terrible, so that is exactly what they got. Why report any more if it won’t get you more views? Something else I think irks a lot of people about Ireland is his supposed arrogance. He has never been one to do a lot of interviews or press conferences. That has changed recently, but I still don’t think a lot of fans are convinced. In their minds he is an evil, pompous man so full of himself that he refuses to take any input whatsoever from anyone else. I’ll be honest. I’m not really sure where fans are getting that idea other than the fact that he doesn’t do many media things. Sure, it would be nice to hear from him more, but who really cares? As long as he is doing his main job, which is working on building a successful team, then I couldn’t care less if he doesn’t answer questions from people who will try and twist his words. Jeff Ireland is not arrogant. He is confident, which is the most important quality of any truly successful person. He trusts his evaluations and sticks to what he believes. I would much rather a confident general manager over one who isn’t quite sure of himself. What I believe is the biggest reason for the hatred from a lot of fans is the Miami Dolphins win-loss records under Ireland recently (four straight losing seasons, etc.). Well I’ve got news for you guys. For certain teams in certain situations winning really isn’t the only thing. Just because Vince Lombardi tells you winning is “the only thing” does that mean you should completely ignore the bright spots? It was a year where the Dolphins weren’t really expected to do too much. Does going 7-9 mean you shouldn’t pay attention to the newly added franchise quarterback, or the excellent defense, or the promise our young guys are showing? Winning is not the only thing for the Miami Dolphins. It may be for teams like the New England Patriots and the Green Bay Packers, or for Vince Lombardi’s Packers of the 60s. Teams like that are already established with everything they need to contend for a title right now, but that’s not the case for a team like Miami who still needs a few more pieces to become an established group. Thinking like that 100% of the time is very short-sighted. We need to look at the big picture, and the picture I see of the Miami Dolphins is one of a team who is almost there. I’m going to change the subject a bit now, so bear with me. Do you guys all remember the outrage when Ireland wasn’t willing to pay Kyle Orton franchise quarterback-type money and instead went with free agent Matt Moore two years ago? People (including me) were absolutely outraged. At the time Jeff Ireland was the biggest idiot in our minds because he signed some backup quarterback from Carolina instead of the next big thing in Kyle Orton. Look how that turned out. 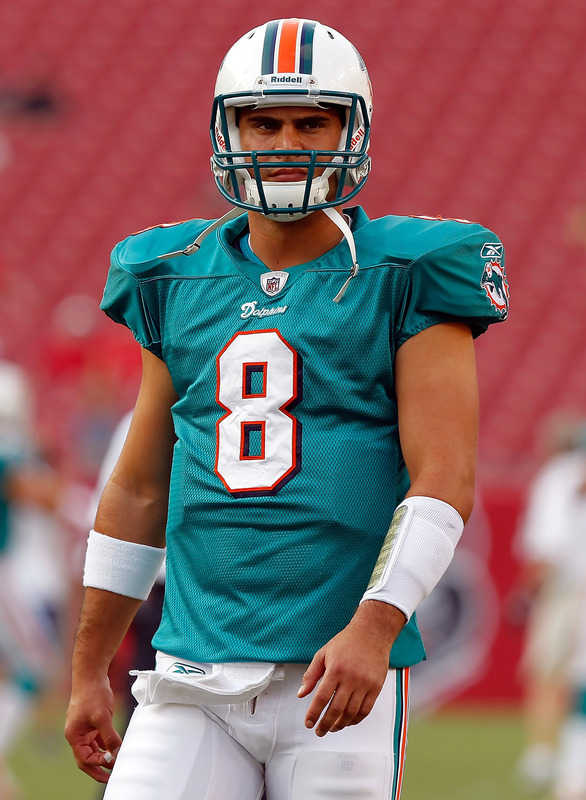 Matt Moore helped the Dolphins go on a run in the second half of the season last year and he ended up winning the team MVP. Kyle Orton was eventually benched in favor for Tim Tebow and is now a backup in Dallas. I always felt like Ireland never got enough credit for that move. He was blasted for being an idiot when he signed Moore, and when it turned out he was right he didn’t get even close to the recognition he deserved. Then, what does he do this offseason? He tried to get Peyton Manning, but Manning ended up choosing a different team. That leads us to the whole Kyle Orton situation all over again with Matt Flynn. Flynn wanted franchise quarterback-type money, and Ireland didn’t believe he deserved it. So, Flynn ended up signing a pretty big contract with Seattle where he didn’t even win the starting job. Miami went into contract negotiations with Alex Smith, but again that didn’t happen. So what did Jeff Ireland do? He brought in David Garrard to compete with Matt Moore for the starting job. Then, he drafted Ryan Tannehill eighth overall, who he expected to enter into the competition immediately, and the rest is history. We finally have the most important piece of a successful NFL team, and we will only get better from here. Imagine what would have happened this season if everything had worked out like Jeff Ireland had planned. Miami lost three of their most important starters before the season even started. David Garrard, who would have started this year, went down with a knee injury that sidelined him for the entire preseason. Chad Johnson, who was Miami’s best receiver by a large margin, was arrested and cut from the team. Eric Steinbach, who was starting at right guard, decided to retire. If those three extremely unlucky things hadn’t happened think about where we might be right now. Don’t get me wrong. I really like the direction this team is heading, but I think we could have done a good bit better this year if we had those three guys. Ireland has always been very smart in his decision-making. He’s never made a move that has crippled the Dolphins. He’s always played it safe, and we’ve been rewarded with a solid team. Now that we’ve got the main pieces in there it is time for Ireland to make the moves necessary to make the Dolphins a playoff team. He’s got the ammunition to do it, and I’m confident he will. We need to look at what we have right now. Ignore what we’ve done. Just look at the players we have right now and what that means for the future. We have a really good core at secondary in Reshad Jones, Sean Smith, and Richard Marshall. We have good linebackers in Karlos Dansby, Kevin Burnett, and Koa Misi. We have an excellent defensive line with guys like Cameron Wake, Paul Soliai, Randy Starks, Jared Odrick, Olivier Vernon, and others. Our running backs are awesome with Reggie Bush, Lamar Miller, and Daniel Thomas. Our tight ends are good with Anthony Fasano, Charles Clay, and Michael Egnew. We need help at receiver, but we do have Davone Bess and Brian Hartline, who could work well with a really talented receiver or two. Our offensive line also looks good with Jonathan Martin, Richie Incognito, and Mike Pouncey. If we are able to re-sign Jake Long he's obviously added to that list, too. And most importantly, we have our franchise quarterback. Once you have your quarterback everything else is easier. What has been the main thing holding Miami back in previous years? The quarterback position. No longer will that be a problem. Whether you guys like it or not Jeff Ireland is here for at least another year or two. Maybe you should stop being so angry and look at how bright the future really is. Ireland is a good general manager. It's that simple. He will never risk the future of the franchise. He brought us our franchise quarterback, built a great defense, gave us an offense that only needs a few more players to succeed, and gave us the picks necessary to fill whatever holes we might have. I’m sure you guys will have a lot to say on this one, so let the discussion begin below. One more thing I want you all to chew on for a little bit. What happens if Dan Carpenter makes those field goals early in the year? Think about that. We could just as easily be 9-7 right now. We wouldn’t have made the playoffs, but I can assure you a lot of you would be much more supportive of what we’ve got going right now.